Name, age, hometown: Brian Wilson, 18, Hobart, Ind. What corps are you in and what is your role this summer? I march in the Pioneer horn line as a first mellophone. Where I go to school and what I'm studying: I'm a senior at Hobart High School. I will graduate in June 2006 with an academic honors diploma. I'll be attending Indiana State University in the fall to major in music education. Give us your full drum corps/marching music background. I played tenors for the Racine Scouts in 2004. I almost took the 2005 season off but I couldn't take not being a part of corps, so I went to Pioneer in April, and I've been there ever since. What's your personal practice schedule like? Hectic, to say the least. With the brass ensembles, jazz band and private lessons, I already have a lot of practicing besides mello music. I try to fit it in at least three or four times a week. What does your ideal free day consist of? I would have to say being able to walk around and see the sights of the city. Some people like to sit and rest all day; I'd rather go do or see something new. Favorite pig-out food: Definitely Chinese food. In the shower you can hear me singing: Whatever I feel asleep to while listening to my iPod on the bus. The last good book I read: "A Winter Haunting" by Dan Simmons, last year on tour. I don't read too much, and it's probably the first time I read a book for myself since I've been in high school. The last great film I saw: I got "Airplane!" for Christmas. A classic comedy. Jobs I have/have had: I worked at a local pizza place before last season. I haven't had a job since tour ended; I'm way too busy to have a job this year. My favorite TV show: "Family Guy" is awesome. 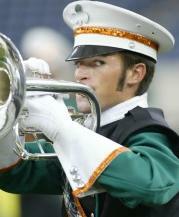 What has been your formative drum corps moment? That would probably have to be quarterfinals 2005. Just knowing how much time the entire corps has put into 11 minutes of music and drill is an astonishing thought. What would you be doing next summer if you were not marching? Being lazy and going to every show near me. How did you decide to be a member of your corps? I enjoyed my time with Racine, but I come from a school with a small band program, so I wanted more. Milwaukee is only two-and-a-half hours away and I really liked the family-ness of Pioneer that I had seen the year before, since they were at 75 percent of the shows we were at. What first attracted you to the drum corps activity? Marching band was my favorite part of our high school program. My friend, who also loved marching band, wanted to join a corps for the summer after our sophomore year in high school, so we went to Racine. I went through the entire season, but he ended up not doing it because of other obligations he had. What advice would you give to young people who want to march? I would absolutely tell them to do it. Drum corps has changed my life and made me into the person I am today. What I want to be when I "grow up": A band director with a successful high school program, and a music tech for a corps. Favorite drum corps personality and why: Former Pioneer director Bobby Lindsey. He always wanted the best for the corps, and tried until he got it right. He's an outstanding person. Best drum corps show ever: Cavaliers 2004 and Cadets 2005. The year is 2030. What does a DCI show look like? Who knows? Drum corps is ever-evolving.